In a statement late Wednesday, the Pentagon said Lockheed will receive up to $928 million to build the new, non-nuclear missile it is calling the "hypersonic conventional strike weapon." "This contract provides for the design, development, engineering, systems integration, test, logistics planning, and aircraft integration support of all the elements of a hypersonic, conventional, air-launched, stand-off weapon," the statement read. On Thursday, Mike Griffin, the Pentagon's new defense undersecretary for research and engineering, said China had built "a pretty mature system" for a hypersonic missile to strike from thousands of kilometers (miles) away. "We will, with today's defensive systems, not see these things coming," Griffin said. 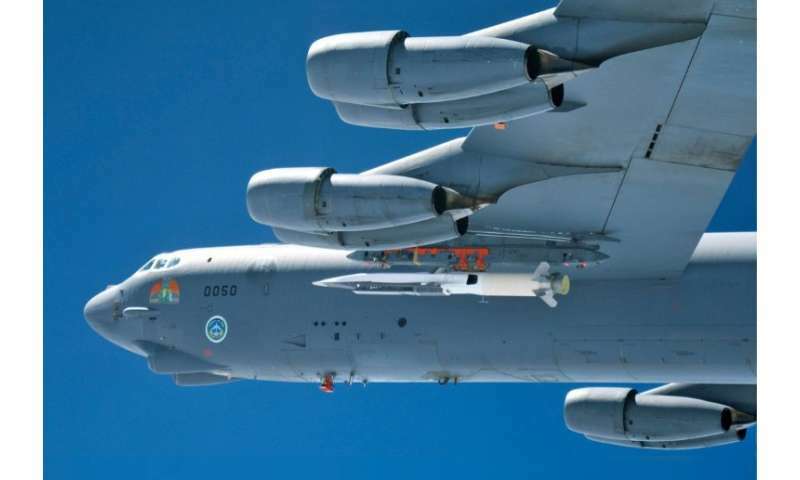 Hypersonic weapons can beat regular anti-missile defenses as they are designed to switch direction in flight and do not follow a predictable arc like conventional missiles, making them much harder to track and intercept. Russian President Vladimir Putin in February claimed to have developed a new type of hypersonic missile that is impervious to any Western shield. Gary Pennett, director of operations at the Missile Defense Agency, recently said enemy hypersonic weapons—which could be launched from planes, ships or submarines—would create a "significant" gap in US sensor and missile interceptor capabilities. The MDA has asked for $120 million to develop hypersonic missile defenses, a big increase from the $75 million in fiscal 2018.